Looking for a handy place to mount your accessory switches that doesn't require cutting or other modifications? 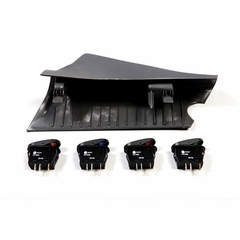 The Rugged Ridge A-Pillar Switch Pod has premolded cutouts to allow you to mount up to four aftermarket switches in easy reach on the driver's side A-pillar, and out of the way of the shifter handle. Our Pillar Pod has the textured molded finish just like the factory plastic pillar cover it replaces. It snaps into place just like the OE! Available for both LHD and RHD Jeeps.